My V8 a year after trying Primative's Buttermilk Pie. While this is not an exact clone, to achieve a similar robust dessert vape requires a heavy hand and more than a few ingredients. To start, I wanted a dense chess pie... and I like mine sweet. The Vanilla Custard with Sweet Cream are at the root of that, complimented by both Inw Creme Brûlée and FA Custard (Inw didn't give me enough of the caramelized top hence the brown sugar & vanilla). You can do with less frosting (but it levels the mix nicely) or without the Super Sweet but at 0.75% & 0.5% why... this is a zero calorie extravagance. The Rich Cinnamon, at just one drop per 30 m, is a must... two is fine, don't cry., it won't destroy things. Another must is the 3:1 Whipped Cream & Golden Butter which are the buttermilk of the recipe.. This key combination was uncovered in 2016 at least. For the crust I opted for a simple 2:1 which does this recipe justice. 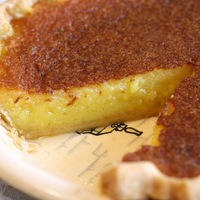 Give it a taste before you dial it down, go back to the original and think, If you were to bake a chess pie, what would you want. This recipe is the property of mrphilip and released under the CC Attribution-NonCommercial-Sharealike 4.0 license. You may not copy, derive or commercialize this recipe without following the terms of this license or the explicit permission of the creator.